While welcoming the Uttar Pradesh government’s move to impart modern education in madrasas, Muslim cleric Maulana Khalid Rashid Farangi Mahali told Namita Bajpai of The New Sunday Express that the government must first equip the madrasas with adequate infrastructure and then take a call on what their purpose is. The BJP government has decided to introduce NCERT books in madrasas. What's your reaction? I welcomed the decision on condition that the government itself should provide trained teachers for the new subjects. In a majority of madrasas, subjects like English, mathematics and science are already being taught, but only at the elementary level. If these subjects have to be taught at a higher level, we would need trained teachers. Is it feasible to combine such subjects with Islamic religious and theological courses? Educationists must sit together and decide if it would be possible for a student already studying courses in Holy Quran, Hadees, Islamic law, Islamic history, Arabic and Persian languages and grammar to grasp subjects like mathematics, physics, chemistry, geography, political science and home science. Will it not be too taxing? Why are these subjects being introduced only in madrasas? Why not in religious educational institutions run by Hindus or Sikhs? Do you think this move is a tool to target a particular community? I don't want to comment on that. I just want them to decide if a student would be able to study so many subjects at once. It would put too much pressure on a student. At the same time, a call should be taken on the purpose of setting up madrasas. Though I feel that introduction of English and computer science would be relevant, other subjects won’t serve any purpose. Are madrasa students considered at par with government school students? The certificate of the UP Madarsa Board is equivalent to Intermediate (Class XII). This certificate is counted while taking admission in institutes of higher education, but passouts with this certificate are not eligible for government jobs. But now the UP deputy CM has said these degrees will be on par with any other degree of a university and these degree holders will be able to appear in all competitive exams and that they will be eligible for government jobs. In that case, I welcome the move. Will this move be applicable to all madrasas across the state? There are 19,000 madrasas registered with the UP Madrasa Board. Of the 19,000, nearly 16,000 are registered on the madrasa board portal. The board is applicable to all of them. Besides, there are thousands of madrasas being run by private entities. 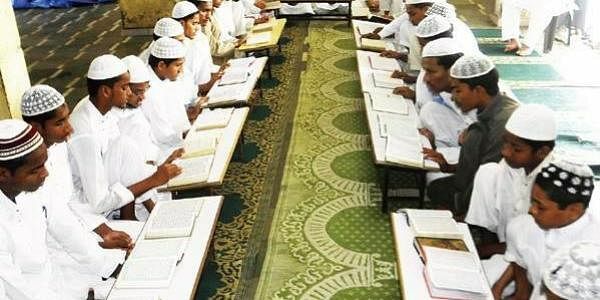 Are madrasas equipped to start courses in subjects like physics, chemistry, computers? No. That is why we request the government not to make a mess of madrasa education. If they are serious, they will have to help out the madrasas with well-equipped laboratories, trained teachers and lab staff. I wonder if the government would go that far, given the condition of sarkari school and colleges. Moreover, only 3 per cent of Muslim children go to madrasas. What about the other 97 per cent who are either going to school, college and university or are not studying at all. To add to this, decisions like the crackdown on slaughterhouses, demonetisation and GST have rendered thousands of Muslim families bereft of a livelihood. Their children are sitting at home without education. The government should also pay attention to their plight. Apart from becoming clerics and ulema, where would madrasa passouts get jobs? They become clerics in mosques or open their own madrasas to teach Islamic jurisprudence and theology to Muslim society. Besides, they are in high demand in European countries and the US as priests. What is the percentage of madrasa students getting absorbed as clerics and ulema? All passouts in India get absorbed in masjids and madrasas here and abroad.